When my aunts, uncles, and cousins all gather together, we inevitably wind up playing Classification. It’s sort of a homemade version of Scategories. And it always leads to lots of laughter, good-natured arguing, and, frequently, staying up way later than we should! It’s a game that growing up I honestly thought everyone knew, but anytime I’ve mentioned it, no one has heard of it. 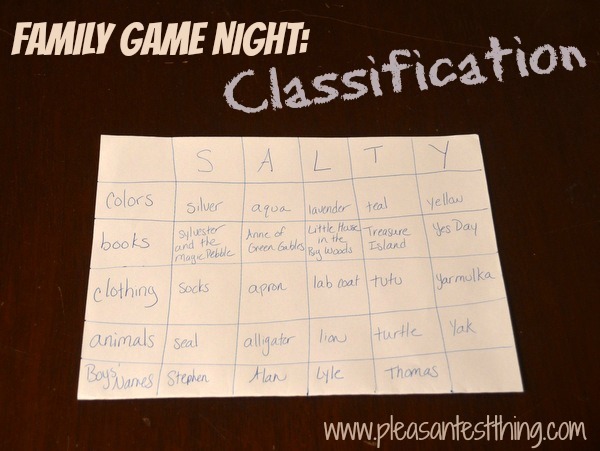 I am also posting today about simple family game nights using only a paper and a pen, and I wanted to link to someone else’s description of this game that has entertained my family for years, but I couldn’t find one! The column on the far left side is for categories. Discuss as a group 5 categories to write in the bottom 5 squares on the left. Some of our favorite categories are: books, games, famous pairs, girls’ names, songs, countries, colors. Once you’ve chosen your categories, chose a 5 letter word, and put 1 letter across the top row (remember to leave the square on the top left blank). For each letter of the word, you will need to come up with an item in each category that starts with that letter. In my example, the word is “SALTY”, and I needed to come up with a color beginning with s, a, l, t, and y. Set a timer for 10 minutes, and try to come up with something to fill in each square! Go around and read your answers out loud.